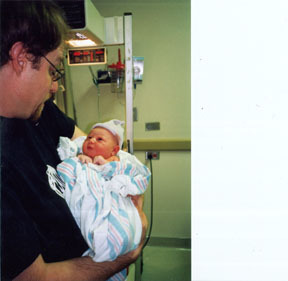 Arlo Benjamin Cortell was born June 1, 1999 at the Chicago Lying-In Hospital, part of the U. of C. Hospitals. Mind you, this is Arlo aged about five to ten minutes. He has been cleaned off and the cord is cut, and that's about it. He is so alert! Perry's parents are Jay and Mary-Brenda Cortell of Boston. They have three children: Perry, the oldest, Karen, and Eric, who is married to Julia. Perry's grandmother, Adele Levine, his parents, and his brother Eric were present on June 8, when Arlo's Brit Milah was held, with William Barrow, M.D. acting as Mohel. Arlo received the Hebrew names of Aharon (Aaron) Binyamin. The Lord lift up His countenance upon you, and grant you peace. This is indeed our prayer for Arlo.